You are invited to a funeral. The deceased is not a "he" or a "she," but a "they." The Swedish doom metal masters have announced that this album will be their last release of original music. The title is more fitting than usual, then. I take the announcement with an extra large grain of salt, but if this is indeed the last true Candlemass album, then at least they leave the scene with an iconic effort. A final album is no time to experiment...it's time to deliver what long-time fans expect. And that's just what we get on Psalms For the Dead. The tracks here are classic, archetypal Candlemass, even more so than their last few albums. We get slow, epic doom metal dirges, more uptempo metal songs and various combinations of both. The vocals of singer Robert Lowe have never sounded more plaintive, which is bittersweet as the band recently announced his departure from the fold. Again, he leaves on a high note. It remains to be seen if this is truly Candlemass' last gasp, but take no chances...bow your heads in remembrance as this doom metal classic reverberates through the ether. I could not possibly conceive of a better opening track for a Candlemass album than this. It begins with a massive riff that drips pure and total doom, then switches to a swinging, crushing groove as Lowe's clear crystal tones ring forth. One can notice the increased usage of a rich organ on the album, which adds the correct Gothic atmosphere. 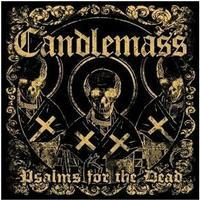 The pace of this cut is quite fast in parts but Candlemass has never been an act that focuses strictly and totally on slow music. Let's just call this what it is...an absolute classic...and leave it at that! Massive drum beats introduce this grim and trudging funeral march. If "Prophet" was a little too peppy to be called true doom, there's no such confusion here. This is slow, ominous and gloomy but catchy in a perverse way. I love the chorus with the weird theremin-like synth tones. There's a brief uptick in speed and a killer guitar solo from Lars Johansson but the overall feel is pure traditional doom metal in Candlemass style. This is the shortest song on display but lacking no power because of that. It's a great aggressive and fast metal song with awesome vocals from Robert Lowe and surreal fantasy lyrics. Listening to this track, you realize that Lowe is going to be really difficult to adequately replace. Another axe workout from Johansson also displays his underrated talents. Much like "The Sound of Dying Demons,” this switches the feel back to a slower, purer doom mode. This song is pretty familiar Candlemass fodder, driven by Leif Edling's spooky bass noodling and Lowe's ghostly vocals. One could make the assessment that it's a bit too typical and I couldn't disagree completely, but the sound and execution is so top notch, it's hard to be displeased with the final result. It's not a highlight, but neither is it a lowlight. Wonderfully rich and mystical synth sounds serve as the introduction to this excellent cut. Throughout the length of this track, there is a real feeling of the majesty and mystery of ancient Egypt, transmitted by the powerful plodding riffs and the atmospheric keyboard sounds that accompany them. There is something here that reminds me of Dio's early albums but translated through Candlemass' own aesthetic. If you can close your eyes and imagine yourself in another place and time while listening to a song, then that song is utterly successful. That's what we have here. The title track reeks of sinister Sabbathian crunch mixed with eerie mellow melancholy. This cut really emphasizes that excellent organ sound, which adds so much atmosphere to the chorus and forms a cushion for Lars Johansson's solo work. The song twists into a chugging rifferama in the mid-section before returning to the original theme. If the title track had a Sabbath feeling to it, this one is outright worship of the masters. The main verse riff sounds like a twist on the classic "Iron Man" hook in some ways. It's not what I'd call a rip-off, since the song has plenty of Candlemass feel, but there's no doubt this is an homage to the original Sabbath albums. A very peculiar noisy soundscape brings us into this throbbing doom metal dirge. That Jon Lord Hammond organ starts to take control here, working in equivalence to the guitar. In fact, without the organ, this song would be almost caveman-level simple, but the instrument adds a real richness and doesn't detract from the heaviness at all. The organ solo is spectacular! The one real misstep of the album is the ridiculous spoken word opening to this final cut...an Englishman making pseudo-poetic observations on the nature of time. It comes across as silly and a time-waster. Fortunately, the song itself is better. When the metal kicks in, it's powerful and driving...definitely one of the quicker tracks on the record. It's a quintessential Candlemass number.